748 Village house in the charming village of Tereglio of 240mq set on 2 levels with panoramic terrace. Village house in the charming village of Tereglio of 240mq set on 2 levels with panoramic terrace. Ground floor – Noble portal, hallway, stairs, bright and spacious kitchen, bathroom with bathtub, large livingroom with access to panoramic covered balcony, 2 large rooms used as bedrooms. First floor – there are 2 bedrooms, 2 large rooms one with wood burning oven and the other with a fireplace. This room appeared to have been used as a kitchen. The property does not have central heating system. A charming self contained town house in the village of Tereglio. Town house in Coreglia Anteminelli, Lucca. 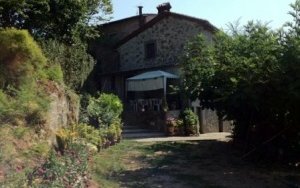 Pleasing town house of approximately 300mq with barn, terraced gardens and cellars, situated in Tereglio, Coreglia Antelminelli.